Scroll down to learn more about gifts in Will and other types of legacy gifts, or contact us today. Listen to Hamid Ghassemi-Shall share his own story about how his five-year ordeal in Iranian prison ended after thousands of Amnesty International supporters joined the movement to free him. 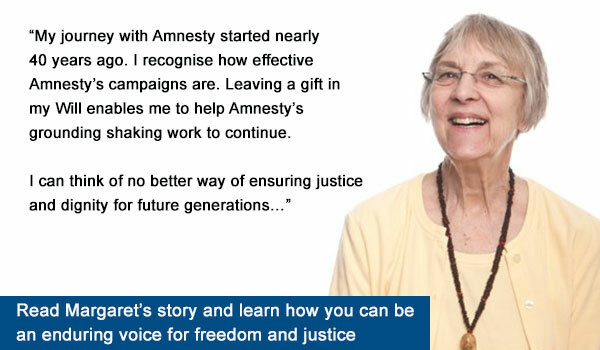 Your gift of a lifetime—a gift in your will to Amnesty International—can help save lives, end torture, and free the wrongfully imprisoned now and in the future. Download our full information package about becoming a Human Rights Guardian by making a lasting gift for human rights through Amnesty International. Download our basic guide to writing your will for tips on the information you need before meeting with an estate lawyer, and the things you should consider before selecting an executor. Whatever form of legacy gift, you will pass on the values that you believe in and stand for during your lifetime. Your legacy gift, whatever its size, will help stop human rights violations for future generations. If you are thinking about leaving a gift in your will, or any of the other ways to leave a lasting gift for human rights, we would be happy to talk to you about this important decision.